These plates are issued to veterans of the Armed Forces. Initially, these plates were issued to those who suffered loss of a limb. The first iteration of this type was identical to passenger plates with a 'DV' prefix followed by 1 to 3 numbers. Later on, the 'Veteran' caption was added and all-numeric serials with 1 to 4 digits were used. In late 1997 a new graphic plate was introduced, with a light blue gradient background and a flag to the left. These plates were now available to ALL veterans. The initial series of these plates was from 100-VET to 999-VET. Later, a generic 100-VAA series was started. Combination plates started in the 100-VSA series. Handicapped Veteran plates are also issued on this new base, with a 'V' suffix. See picture below. ca. 1953. I'm not sure whether this plate belongs here or not. It's widely held that the DV type started with the 1957 base; but I'm not sure what else this could be. The 'D' series wasn't used for normal passenger plates. Initially, Veteran plates such as this were issued to those who suffered loss of a limb. 1980s revalidated to 2002.
ca. 1999/2000. 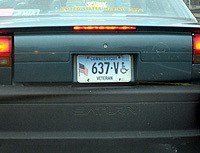 When this type of plate was introduced in 1997 all Veterans became eligible for these plates. 2004 Veteran Combination, with a remake of an existing number. New plates of this type started in the -VSA series. 2007 Veteran Combination, in the normal numbering series for Combination plates.